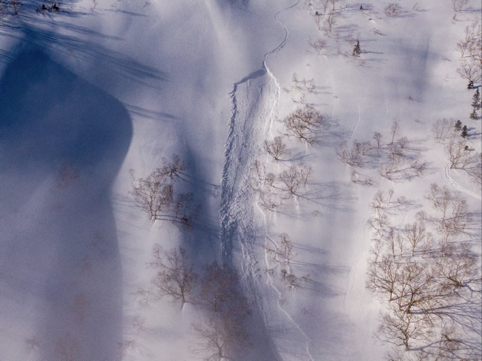 I’ve been a ski guide here in the Hakuba mountain ranges for over 10 years. Myself and my guiding team are out on the backcountry almost everyday in the winter season and we see a wide range of people out in the field. We often run into other guiding operations, recreational weekend warriors, tourists on holiday and even skiers and boarders out by themselves. We see many groups and individuals making both good and poor terrain choices in the backcountry. 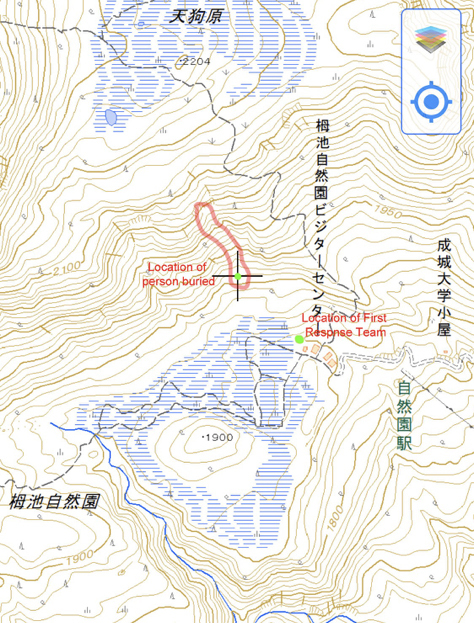 On this particular day we had four guided groups in the Tsugaike area. We had a beautiful sunny day and over 30 cm of new snow over the past 24hrs. The winds had been up for the past 12 hrs, lots of snow transport had been going on and temperatures were meant to climb as soon as the sun came out. Conditions were going to be epic and they turned out to be pretty damn sweet where we skied our first run on Tenguhara main bowl (lookers right of the normal ascent route). On our ascent we saw a male Japanese telemarker out by himself ski the Tenguhara face beside the up-track. We met him on the up-track and I asked how the snow was and I commented on the nice weather. We stopped and he continued above us,up the climbers left up-track towards West Tenguhara. We got to the top of our run, de-skinned and rode some excellent powder down the Tenguhara main bowl, then traversed over and skied straight on down to the small mountaineering museum hut beside the Tsugaike Hutte. We were just starting to eat lunch with our guests when I looked up and saw a fresh avalanche crown that was not there about 2 min ago. There was one set of tracks going in, but no tracks coming out from the bottom. 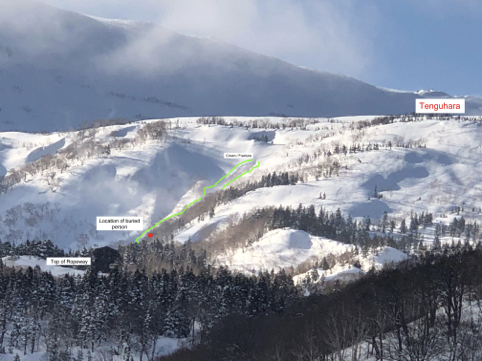 This particular slope is a “repeat offender” as I had seen a skier trigger and be caught in the exact same spot this past January, luckily in that case the guy lost just a ski was not swept down very far and was on the surface. I decided to check out the avalanche, as we saw no tracks coming out from the bottom. It took me about 5 min to skin up to the bottom of the debris, turned my beacon to search, walked another 10 meters, then got a signal of about 28. At this point I called in to my other guides in the area, telling them I had a signal and was starting the rescue. I followed the signal to where I saw a ski poking out, there was a boot attached to ski, and a skier attached to the boot. I immediately got my probe out, probed his torso or backpack (about 80 cm down) and started to dig, also radioing in that I needed immediate assistance. which was holding arm down. His head was about 1 metre down facing into the mountain. He was lying across the mountain, his feet were to the left, his backpack was on, he had no airbag and his beacon was on SEND. Two other Evergreen guides arrived on the scene after 5 minutes and we rolled him onto his back to begin checking his vitals and staring first aid. 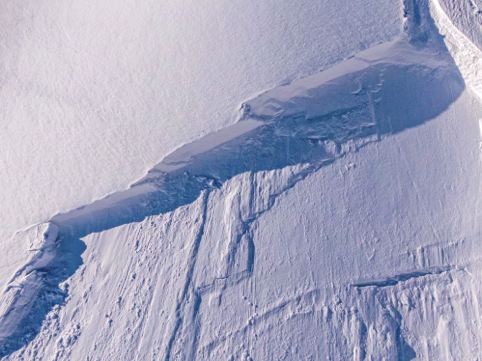 The buried skier was not conscious, not breathing and had no pulse. We checked his airway (which had snow in it), we cleared that out, set on the CPR mask and gave two rescue breaths. While I was giving breaths, the other guide immediately began chest compressions. With three staff members there, we were able to switch rescue roles and I was able to act as the communications person. 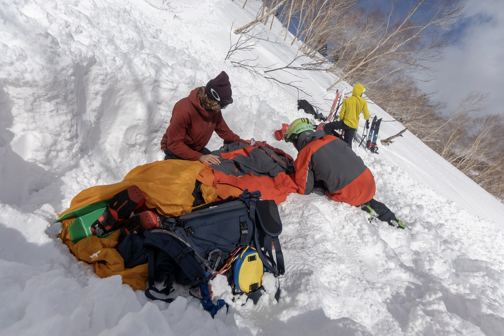 We called into Evergreen Base, then I spoke with Omachi & Hakuba police who confirmed our location, the weather at the location and then arranged a helicopter long-line evacuation. After 20 minutes another Evergreen guide arrived to help and luckily he had a nasopharyngeal airway (latex nose tube) which allowed us to keep his airway open. We treated for shock, and kept him insulated and warm. The additional first aid we did was, we treated (splinted) a possible broken arm, possible broken leg and possible dislocated shoulder. After 30 minutes of doing CPR, to our astonishment and total relief, the man began to get an erratic pulse and began to breath again on his own. We were so happy and felt our efforts really amounted to saving his life. We positioned him in the recovery position on his side and closely monitored and took notes of his pulse rate and breathing rate. About 1 hr and 30 minutes later the helicopter arrived, two helicopter rescuers arrived and took over the care of the man. For them to secure him and prepare him for the long-line extraction, the decided to roll him onto his back and remove all the covering insulation we had used. Subsequently by being rolled onto his back the man vomited therefore we had to get him quickly into the drainage/recovery position and clear his airway again. He continued to breath on his won, thank goodness! They then secured him into a sewn rescue harness long lined the man out. Meanwhile while we were doing the rescue and first-aid, our other guests were taken safely back down to the resort by the other guides. Since there was still overhead danger of avalanches coming down on us while we were doing the rescue, we had one tail-guide keep an eye on the terrain above us and would radio us if any other groups were coming in above us. 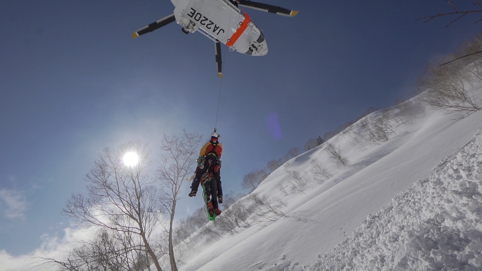 Once the man was helicoptered out, we packed up our rescue gear and skied back to Tsugaike resort. I have met with the man’s family who were very appreciative of all the efforts of our guides and told us the man is Matsumoto hospital, he breathing strongly on his own but sill unconscious. We were all super happy to be able to aid in this rescue, do CPR and bring him back to life. As with many major accidents and rescue situations, we had a solid team debrief and review of the rescue. This allowed us to comment on our own response and action and plan to make any future rescues even better. 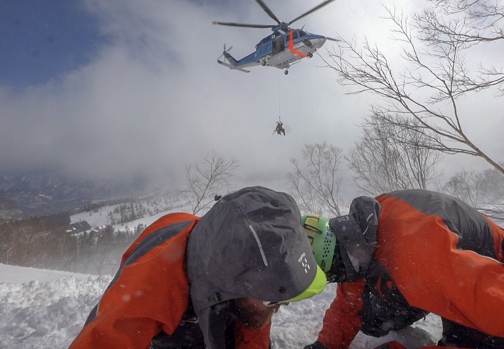 What I really took away from being involved in this avalanche rescue are a few key points. Having a good team to support you is really critical in getting an effective and ultimately positive outcome. Having the right First-Aid equipment with you is so important. In this case the nasopharyngeal airway was what saved his life. Oral or nasal airway tubes with a good CPR mask is critical. 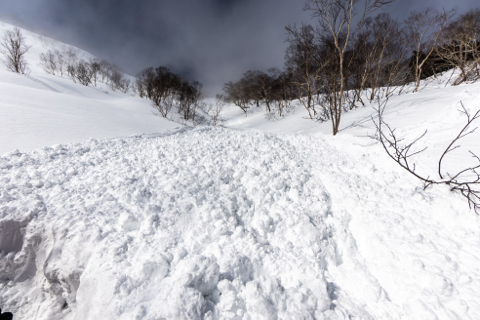 Skiing or riding alone in the backcountry is super risky. Please note this skier was skiing alone, not part of any group and not part of an Evergreen tour.